As reinforcement to my New Year resolutions I have a pile of cookbooks on the table beside the couch, so now, no matter how lazy I’m feeling there’s a cookbook within easy reach. I’m ashamed to say I’ve discovered a vast numbers of previously bookmarked but ignored recipes. It’s no secret I’m an admirer of Claudia Roden. Her seminal work from the 1980s “The New Book Of Middle Eastern Food” has been a huge influence on my cooking. I love reading the historical and social commentary that intersperses her recipes. It imbues the food with life. After my recent foray into tapas style dishes it seemed logical to put Roden’s “The Food of Spain” at the top of the pile. Like her other books, Roden’s “The Food of Spain” is about regional everyday cooking. In this recipe the sauce for the meatballs is thickened with a picada, a fine crumb of toasted almonds, breadcrumbs and garlic, a technique unique to Catalan cooking. Meatballs should be moist, tender and tasty. My favourite all-round meatball mix uses pork with a little fat, finely minced vegetables and a binding of wet fresh breadcrumbs, a formula learned from a wonderful Calabrian cook I worked with many moons ago. Roden uses a similar technique. A generous measure of salt and freshly ground black pepper are essential in meatballs. It’s important to check that the seasoning is well balanced, you want tasty meatballs. The best way to check is to fry a little patty of mixture and taste. More often than not, I find more salt is needed. It’s the almond sauce that makes this dish a standout. Fruity white wine and homemade chicken stock are thickened with almonds and soft breadcrumbs sautéed briefly in garlic oil, then processed to a fine crumb. It makes a truly great sauce. There are no tricky techniques, just simple direct cooking that produces a delicious result. I have modified Roden’s recipe slightly to accomodate my food intolerances. Heat the garlic oil, then fry the nuts and bread until golden. Soak the bread in a bowl of water for 5 minutes. Squeeze the bread dry with your hands then crumble it into a mixing bowl. Add the egg and whisk the mixture together into a paste. Add the meat, vegetables and seasonings, use wet hand hands to knead the mixture until smooth. Heat a small pan and cook a small patty of meat to taste the seasoning. Adjust if necessary. Shape the meat into ball about the size of a walnut then roll in rice flour. Heat 1cm depth of olive oil in a frypan, then brown the meatballs on all side. They won’t be cooked through but remove them from the pan and drain on kitchen paper. Put the stock and wine into a wide pan and bring to the boil. Add the lemon zest and seasonings. Add the picada to the sauce and stir to combine. Add the browned meatballs, return the sauce to the boil, then reduce the heat and simmer, uncovered for 20 minutes. The sauce will thicken toward the end of the cooking time. I love that recipe and have made it many times. Thanks for reminding me! This looks and sounds great. To be tried. i always do then i just go my own way. Tee hee. Everyone I know seems to love Claudia Roden and just somehow I have always walked past her: first matter to be rectified ! And seem to have made every kind of meatball during my cooking years, especially anything even vaguely Asian but Spanish also has not been tried 🙂 ! About time for that too! Like the almond sauce with the picada tho’ have to buy white bread as never use any and my white wines are not exactly ‘fruity’: interesting trip !! These sound fabulous! I love the sauce but also the almonds in the meatballs. Brilliant. 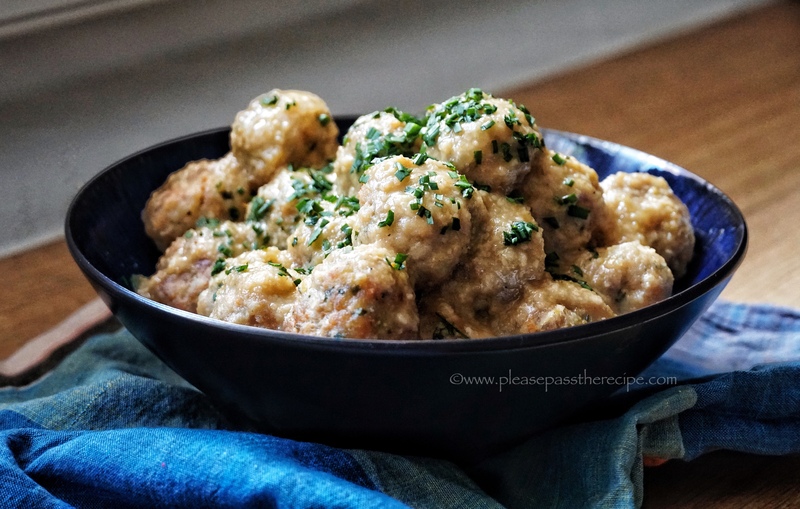 This entry was posted on February 7, 2019 by ladyredspecs in Cooking, FODMAP diet, Food, Main Meals, Pork and veal, recipes and tagged Catalan meatballs, cicada, Claudia Roden, FODMAP diet, meatballs, Spain, Spanish meatballs, the Food of Spain.